Leopards have the largest range of all the big cats. They are known for their incredible stealth, but this beautiful cat is quickly losing its habitat range and is often the target of trophy hunters. Leopards are a strong and powerful member of the big cat family. They are capable of taking down prey three times their size and will often take it into trees to prevent larger predators from taking it away. Leopards are found in Africa, the Middle East, and Asia. They have the widest range of all the big cats but as with most large animals, they are losing their habitat at an alarming rate. Aside from habitat loss, the leopard population is decreasing due to poaching and trophy hunting. Leopards account for a huge number of animals hunted each year for their parts, especially their pelt. Still, other leopards are killed in retaliation for killing livestock or to prevent them from hunting livestock around villages. Leopards are the smallest of the big cats but also regarded as the most adaptable. Leopards are considered big cats because they roar instead of purr. Instead of vertical slits, they have round pupils, which is a trait of big cats. Leopards are extremely stealthy and strong. They will typically take their prey into trees to avoid it being stolen by larger predators. Leopard coats are sometimes melantistic, meaning they look all black, but in the right sunlight, you can still see their spots. Black leopards are found in rain forest habitats. Leopards are the largest cats to regularly climb and spend time in trees. 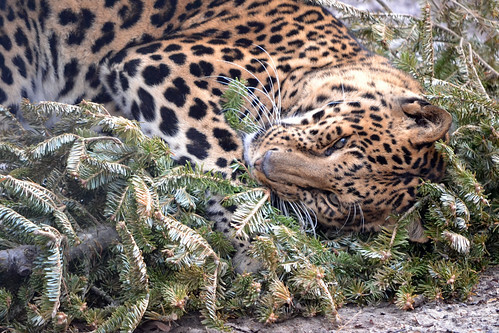 When resting or sleeping they often sprawl out over branches to take a snooze. Although they have the “leopard” in their common name, snow leopards and clouded leopards are different enough that they have their own classifications. Leopards can run up to 36 mph for short distances. Male leopards can weigh up to 165 pounds. Leopards are extremely adaptable animals, but there is only so much adapting they can do. Without a conscious effort, we are going to lose one of our most beloved big cats. There are simple ways to help protect leopards. Avoid trophy hunting and avoid supporting places that promote it. Do not buy materials made from leopard parts.